We are the fourth generation to run the company’s biological family. Our challenge was to take an old tradition according to which the art of making wine is to be able to interpret the nature, given that “nature is controlled only obeying her”. Our mission: to produce a wine with natural, healthy, good and respectful of biodiversity of nature and its rhythms. Our vision: to return to manage with the heart. A small vineyard, a small cellar, a large Passion. Geographic Area: the production area falls in the town of Cortona which includes the land suited to the quality and production of grapes suitable for the production of wines DOC CORTONA. Our vineyard insists in the western part of this territory, the one down the stretch to the border with Umbria, here the “Toscana knows a bit ‘of Umbria”, in a campaign where people live and work the land. Climatic area: the region’s climate is Mediterranean in character and in particular the area where is located our vineyard is favorably influenced by the proximity to the lake Trasimeno. A micro-climate ideal for growing vines, well-ventilated area, where the fogs are rare, cold dry winter and spring fairytale. Rainfall is distributed in the months from October to December and March to June. Average temperatures in spring are from 11.5 to 12.5 degrees Celsius in summer and those averages 23-24 degrees Celsius. We’ll take you to the discovery of two great red wines Natural, Sangiovese, sustainability and tradition. We work for sustainable and healthy agriculture that has as its goal the fertility of the land and the balance of the plants. Full respect for the land, the vine and the natural cycles. We work processes of the soil, sowing grass and green manure with total exclusion of chemical fertilizers, herbicides and pesticides. To combat the diseases we only use natural products allowed in certified organic agriculture. We help our vines with homeopathic preparations such as infusions and decoctions, according to the teachings of R. Steiner. Seek balance and harmony of our vines trying to recover perception of the rhythms and seasons. Spontaneous fermentation, with yeast generated from our vineyards and natural on the skins for 12 days, with regular punching down of the must, in order to confer sensitivity to the tannins, without temperature control or other constraints aimed at changing the natural rhythm of the must and wine. Exclusion of all aromatic yeasts and any additive aromatic. Chemical or physical interventions are excluded, clarification and filtration, which alter the balance of organic and natural wine, but only sfecciature and racking at times “when the moon is good” and periods of the year. Agritourism in Cortona in Tuscany. Agritourism and farm Tuscany. 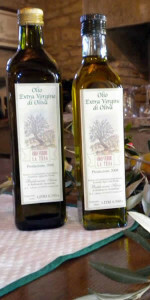 Farm la tesa, production of wines and oil extra virgin in Tuscany. Production of red wine in Cortona, Arezzo. Production of red wine sangiovese. 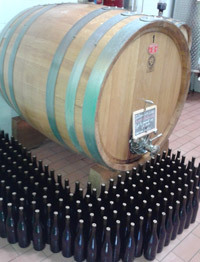 Production of tuscan red wine. Organic certified farm. Biological products, natural red wine and oil.